I took quite a few photos on our non-traditional holiday. After our meal (beef, not turkey), we took a hike in a local park. It was a pretty day for November in NC - about 60 degrees was the forecast. We followed hilly trails so felt very justified in dining on pumpkin pie for Lenny and ice cream for me when we returned. The photo above is probably my favorite. 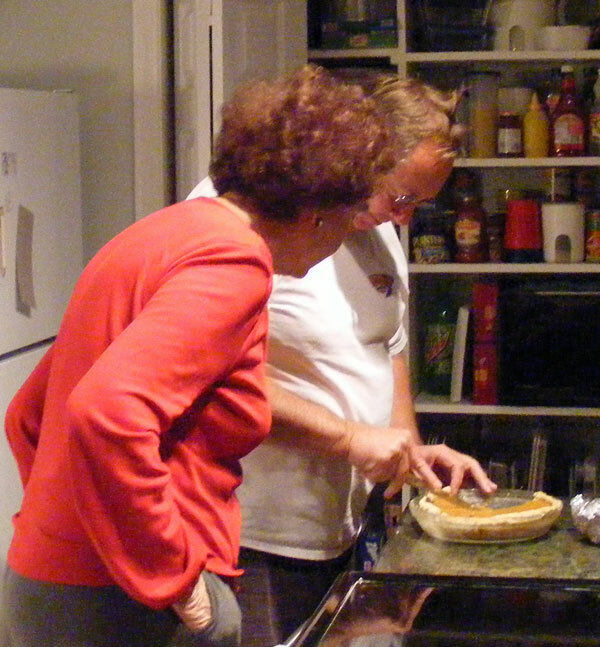 The subject is traditional for Thanksgiving - making sure you get a big enough slice of the pie. My parents came over late in the afternoon full from their own meal out (they really do love to eat out). So they wanted to take their pie with them. Lenny is cutting their pieces with lots of supervision from his mother-in-law. He's used to it. Glad the camera was handy. 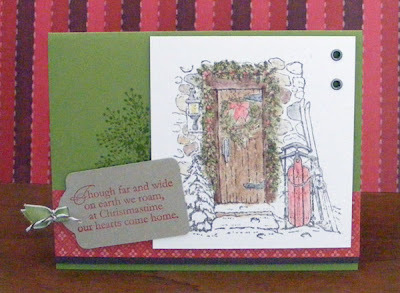 This morning I finished my "Home for Christmas" cards with a couple more arrangements. 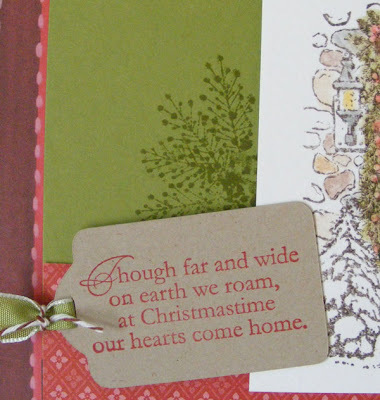 In this one, I needed something to balance the design so I used a pine needle design stamp from Inkadinkado stamping in Old Olive on Old Olive cardstock. Just enough. The tags were cut with the Cricut and I can't get enough of that baking twine from Martha Stewart. It comes in a package of 2 spools each of brown/white, green/white and red/white. Old Olive ribbon from SU! 's Holiday Mini catalog.